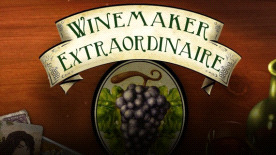 Escape the ordinary and experience the extraordinary with Winemaker Extraordinaire, a fantastic new challenge that lets you blend your very own wine. Step into the shoes of Maria Bellaventura, a regular girl stuck in a dead-end job. When she gets the chance to take over her grandfather's small winery in the Italian countryside, she ditches the dreary world of the office and embarks on the adventure of her life. Travel the world on a quest to collect new recipes and exotic grape seeds and show the illustrious Guild of Extraordinary Winemakers you've got what it takes to be a world-famous winemaker. If you succeed, the Guild will share with you your grandfather's secret recipe for the world's finest wine, the Vino Ultimate Blend.